I love classic perennial borders and great splashes of annual flowers, but over the years I’ve reluctantly abandoned the idea of having them part of my gardens. I give the time and space I have for gardening to a kitchen garden, vegetables and fruit. Vegetables do have lovely blossoms, of course. Peas and runner beans, potatoes and squash all bloom, but only briefly on their way to becoming food and not with the continual bloom of real flower gardens. If like me you yearn for a patch of flowers but don’t want to take time away from vegetables, consider perennial herbs. 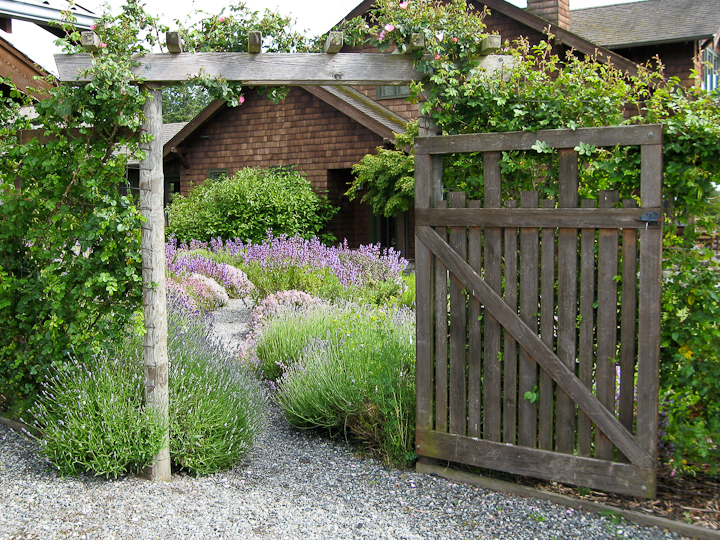 Years ago, I planted an herb garden along the path that leads to our front door. Each spring it’s filled with blooms for long enough to satisfy that part of me that still dreams of growing ornamental gardens. Over the fifteen years that I’ve grown herbs in this garden, I’ve narrowed the selection to those that thrive: thyme, sage, rosemary, chives, hyssop, catmint and lavender. All bloom intensely in shades of blue, pink and purple for most of May and June. The rest of the year, after I sheer back the spent blooms, the plants offer shades of green and gray, and spiky, soft and lacey textures, all beautiful and even better all available to flavor the vegetables that claim most of my time. Another plus of perennial herbs is that they grow well in areas where vegetables would struggle. The 24 by 40 foot site of my herb garden lost what topsoil it had during house construction. The clayey subsoil that was left gives way to bedrock in places. After a couple of seasons of cover crops and the installation of curtain drains under gravel paths to draw away winter rains, I was left with a planting site that was OK, not good enough for vegetables but fine for herbs. If you want to give perennial herbs a try, most are easy to start from seed or cuttings. Seeds of sage, thyme, catmint, hyssop and chives germinate easily. Even lavender was surprisingly easy because I used the variety Lavender Lady, an AAS winner in 1994 that blooms the first year from seed. And rosemary branches from a friend rooted in water and grew well. Space plants twelve to eighteen inches apart and in a season or two they’ll fill in the spaces between and spill over the paths. 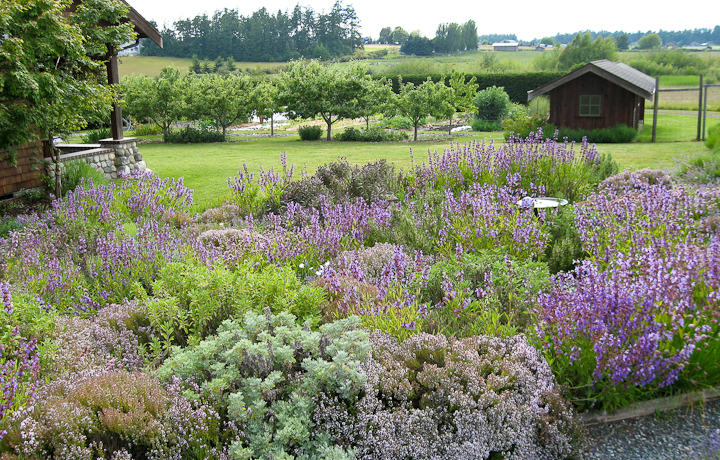 I irrigate my herb garden several times a summer because Northwest summers are so dry but herbs do tolerate drought. Nichols Garden Nursery catalog of “herbs and fine seeds for the gardener cook” offers a great selection, as do the herb sections of most seed catalogs. Two herb garden design books that inspired me are Ethne Clarke’s Herb Garden Design and Jim Wilson’s Landscaping with Herbs but the greatest inspiration was a short row of blooming edible herbs I planted as an experiment and discovered could stand in for a flower garden.